"We have always said it, hooks are a massive thing for us. Even these days a lot of the time in music people don't seem to know how to write a hook. For us it has always been about that, we feel it is important to be singing the song after playing it or after you have come away from seeing the gig." Himalayas have definitely proven that they can write hooks and tunes. Thank God I'm Not You is a huge success on Spotify and looks set to reach 7 million hits. But performing well on one of the world's leading and most popular music streaming sites is only a part of the Cardiff band's current success. There is a lot to be excited about right now including the wide range of live music opportunities the band are at the receiving end of this year. 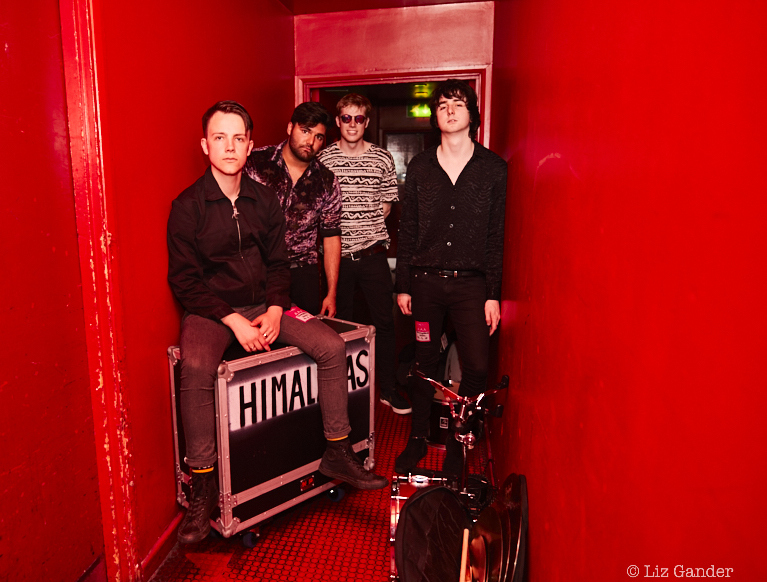 Only last week guitar band Himalayas announced they had been confirmed for the BBC Music Introducing Stage at Reading and Leeds Festival as well as Horizons for BBC Wales at Festival No 6. 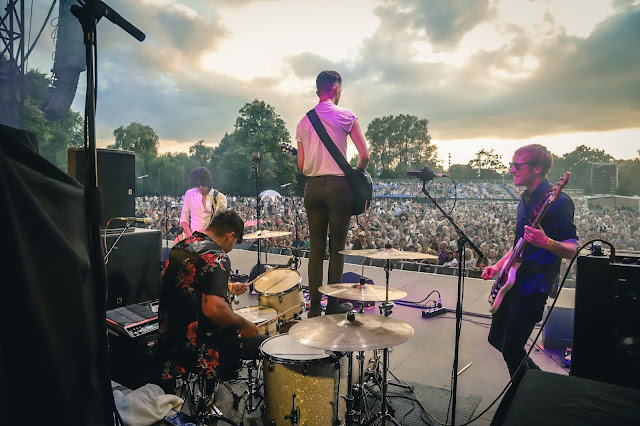 Having already shared the bill with The Kaiser Chiefs twice a few weeks back, the band just completed a full circuit of festival sets including the likes of Truck, Y Not, Tramlines and a headline set at Nambuccapalooza in London. They are also due to headline HOYfest late September in their hometown. Commencing the year on a high, Himalayas played sets at SXSW in Austin Texas, an experience big enough in itself but it is almost a metaphor for everything else that followed, due to the scale of the event. Singer and guitarist Joe Williams, guitarist and vocalist Mike Griffiths, drummer James Goulbourn and bassist Louis Heaps have been on the go close to non-stop and 2018 must be the busiest year they have had so far. To get some reaction from the band and find out what they are likely to be doing beyond the summer festival season, It's All Indie caught up with Mike and Joe. Playing the big summer festivals around the UK with other bands is clearly one thing, Himalayas have good relationships with the promoters who have been supporting them from the start. But little did the band know that they would end up playing four shows that hectic weekend back in July. But Nambucca is special to the band, they have a connection to the venue and the promoters who have been behind them and giving them opportunities to play. Were you offered the Nambuccapalooza slot first or in what order did it all happen? 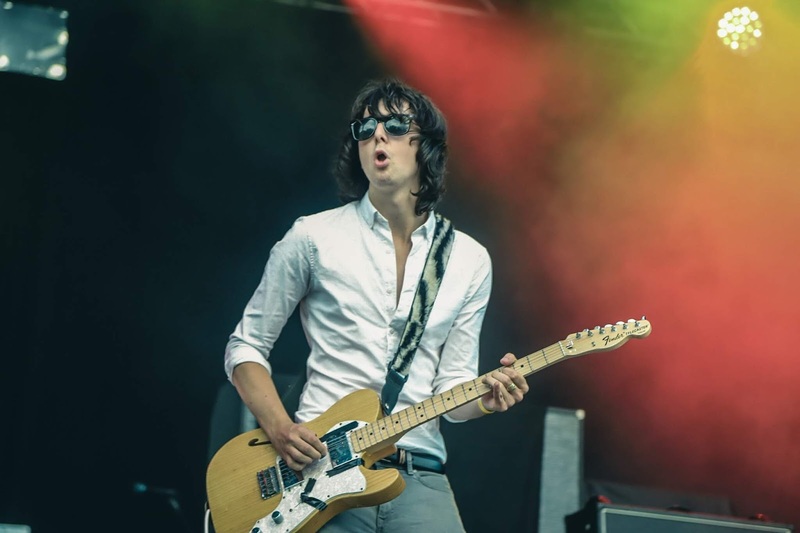 Mike: Nambuccapalooza was the first festival we got offered for that weekend and the other festivals came up after but we absolutely love playing there, it is such a dream. It is one of my favourite venues and whenever we get asked we just say yes straight away. Joe: It is a really nice venue and it is actually just around the corner from where my mum grew up so that is just kind of a weird thing. The first time I came here I did not even know and when I came home, my mum was like 'oh you played around the corner from where I used to live'. It feels kind of weirdly homely. It is really good. 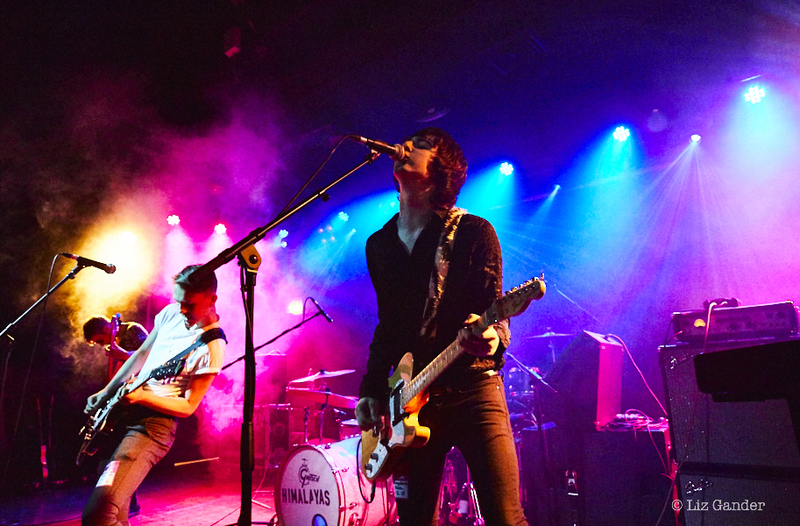 With a diary jam packed with festival appearances and gigs, it is no wonder the band's priorities may be a little less focused on working and recording in the studio. But the band members are more than happy to think about how they want to approach things. Initially, the plan was to release a debut album this year but things have worked out differently, in the best way possible. Mike: I have been writing a lot of stuff but it is not going to come out immediately. The good thing about it is that we have a bit of control over what we are doing. What I would hate to do is to release an album full of really good stuff and then have nothing left to release after that. There is a lot of pressure on you then, so doing it now and having some sort of idea of what you want to do beyond that is a nice position to be in. We can be quite disorganised with everything else (laughs), so to have control of what we write is really good. How do you feel about the success with Thank God I'm Not You? Did you ever anticipate it becoming as big as it is? Joe: I think it is a good song. I was at university at the time and I remember being on the train. We had literally put it up a week before when I remember getting phone calls from our manager to say 'I have this amazing news, you are going to be on Edith Bowman and be live on Virgin Radio'. The first million hits on Spotify was great. It is just over a year since we released the song and it has had 6.5 million streams since then. Mike: It was not expected at all, we were hoping we would get a lot of attention because it is a good single but the way it has all gone is incredible. That was a weird thing, the track was on Edith Bowman and it was on the list for weeks to come. The thing we knew was that we had had two million plays on Spotify and it also got playlisted on Radio 1 at the time. To what extent is your success on Spotify likely to influence any future songwriting? Knowing that your debut album is being postponed, what can we expect from Himalayas in the months to come? Joe: For me the way I see the whole thing with Thank God I'm Not You is similar to what I really like about the early Kings of Leon albums. It is really raw and I always liked that about them. I like their first and the second album. You are not going to get much rawer than this, it is like something that has been done in someone's bedroom, it sounds amazing because it is just like raw instruments, it sounds brilliant. It is like a mix of that and stuff the Manics have done. Mike: But we will write songs with a lot of hooks and we will be focusing on that even more on than what we are doing now. Maybe the material will be less heavy and more poppy than what we have at the moment and it is going to be a long road to get there. We are writing songs and are still to finish the ones we are doing. Joe: We have always said it, hooks are a massive thing for us. Even these days a lot of the time in music people don't seem to know how to write a hook. For us it has always been about that, we feel it is important to be singing the song after playing it or after you have come away from seeing the gig. Is your plan to continue working with producer Steffan Pringle? What does he bring to your recordings? Mike: I really hope so. There is a mutual element of trust. I think we are in a position where we know whatever we give him he is going to do a good job with and we expect him do a good job. Equally, he will expect us to give him good stuff to work with. We are such good friends with him as well, it is just a really nice dynamic to have with a producer. I don't want to produce with someone where you turn up for a couple of weeks, do your thing and then never talk to that person ever again, it is not the way that kind of relationship should work, it should be similar to how I would interact with Joe or anyone else. Joe: That is the thing with our whole team really, you can just pick up the phone. It has got to be a personal thing rather than just I am doing this because it is my job. I think Steffan is really good at what he does, he pushes you too. It is like you have a box of what you think it is going to be like and he pushes you outside of that box and then you sort of go 'oh really, this is something I should have thought of before'. and more specifically what is going to sound different? Mike: I think there is a lot more nuance with the three tracks we have released from the album so far, it is similar in the sense that they are quite fast songs and are not necessarily pop tunes, whereas, we have got a few tracks that are a bit more monolithic and are big songs. Mike: Some bits where there is maybe two harmonies when were are doing them live. But we have songs where there is three or four harmonies, something we would never be able to do live but it sounds great, so I think over the next six months we will do more of that so a lot of it really is down to what we are doing in the studio. With the two approaches to songwriting, there is no doubt that further nuance is being added and although Mike and Joe's writing styles are different, they complement each other really well. Being comfortable with each other and being able to be honest is key to ensuring quality control can continue to rule and this is key to the songwriting partnership. Mike: It is never a malicious thing but the last thing we want is for the four of us to look silly. If we release a song and it turns out some other bands are going to be making something very similar, then this is clearly not something we want to pursue. I don't know how some bands work with just the one songwriter, we would really struggle because there are points where one of us will write loads and then it will be the other way around, it just works really nicely that dynamic. But I think if you have got a six months period without writing anything then you are probably in lots of trouble. Joe: It is nice to just be able to rely on somebody's else's work because something could be amazing as part of the track and equally something else could be really bad and not work well. Mike: It is good to have another songwriter on board because you can be the sole songwriter and play a song to the rest of the band and they might go 'whatever' whereas if there is another songwriter at least you have got someone to tell you if it is no good. Joe: I don't ever think that things stay the same, I have always liked David Bowie and how almost he almost had different characters per album and I really like that. The whole Ziggy Stardust kind of thing for example. Mike: I don't think we would want to do things the way we are doing them now in the future. We want to keep moving, I think that is really important to us. We don't sound like we did say 18 months ago and so in 18 months I would like to think that we don't sound like we do now. We might go from doing glam to including soul and make music using 80s pop elements. We want to be able to see a clear progression in our work. When it comes to current influences, releases and favourite bands, they love Miles Kane, Arctic Monkeys' Tranquility Base Hotel and Casino, no other album release this year is likely to see fans more divided in their opinions. They are big fans of The Foo Fighters and got to see the band at Etihad Stadium recently. But they just have such an incredible love of music overall and listen to bands you might never even imagine. Joe: The Foo Fighters are such good musicians. I knew about the hits and all that kind of stuff, I was never a massive fan when I was younger but I think like ever since I got into Queens Of The Stone Age that was something that got me even further into them. I have so much respect for Dave Grohl. Mike: Obviously, Nirvana as well, you just can't go wrong there. Himalayas are hoping to release their debut album as soon as. They are working really hard on doing so, they hope to finish it before the end of the year but it will definitely be out in the near future. One thing remains beyond doubt, it is going to be a big moment when it does happen and it will be one hundred percent worth the wait. Not that we have had to wait that long at all, because they are making such fast progress, moving faster than most other bands, so it is inevitably going to seem longer than it is in real time. Joe: Between Mike and myself we have done a fair bit of writing, we already know what our album is going sound like and for us, it is a dream really. Now we just need to put it down once and for all.